For Cree Cicchino, her start in the acting business was just like her home city of New York – big and in great fashion. The 14-year-old actress had not been acting very long when she signed on to what is now one of Nickelodeon’s newest hit shows, “Game Shakers”. Headed by Dan Schneider, the mind behind famous Nickelodeon shows like “Drake & Josh”, “Victorious”, and “Zoey 101”, just to name a few, Cree took on the role of Babe, a witty genius and one-half of the brilliant duo behind the world’s hottest new gaming app – Sky Whale. Described by Cree as independent, Babe is also strong and tough. However, she is still boy-crazy. “We get to see a lot of that side of her in season two,” Cree says. Audiences already saw Babe’s attempts at wooing Mason [Tanner Buchanan] in one of the very first episodes of the new season. As for if fans will see more of Babe’s crush, Cree didn’t leave anyone wondering. When it comes to Babe though, she’s already tried her dancing skills in order to win Mason’s affections. In real life, Cree has been dancing for over a decade. Considering her knowledgeable past in dancing being incorporated into the show, Teenplicity asked what else she’d like to see make it from off-screen to on. With the new season only just starting, Cree is thrilled with the fan response already. 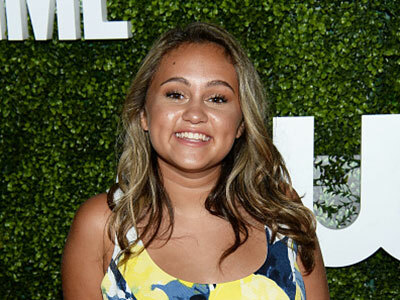 In season two, Cree says that there is more boy drama in store, which, with a laugh, she confesses is really fun to shoot and actually hilarious. She also teases two really iconic moments in future episodes. “I was totally fangirling over [the scenes] during shooting!” she dishes. Considering how big of a fan Cree is of past Nickelodeon shows and Dan Schneider’s knack for bringing in old stars as guests, one can only hope that this means a former cast reunion is in store! Nothing has been confirmed as of yet, though. A treat for Cree came when she got the role of Babe on “Game Shakers”. Another side of Babe is her genius, which she uses with her best friend Kenzie [Madisyn Shipman] to create one-half of the young and brilliant duo behind Sky-Whale. Throughout the first season of the series, the audience watched as Babe and Kenzie sorted through their problems, all the while creating even more fun gaming apps. If Cree had to create her own gaming app, on the other hand, it would be an app that helps you create a gaming app. She can’t help but laugh at her own comment. Since the start of “Game Shakers”, Cree does admit that she didn’t realize how hard balancing life and work would be. As Cree wraps up her interview with Teenplicity, she is able to tease a little bit more about season two. For her last question, Teenplicity asked Cree if she had anything to say to her fans. Below, the 14-year-old actress expressed her gratitude towards them. “Game Shakers” airs every Saturday night on Nickelodeon. Be sure to check out their new episodes for season two! To keep up with all things Cree Cicchino, follow her on Twitter, Instagram, and Facebook!